I mentioned this washing up liquid in a Favourites video. No you did not read that wrong, yes I have gone nuts, what can I say good eco-friendly washing up liquid is hard to find. Bio D has a wide range of household products and they are free from Phosphates, E.D.T.A. (Ethylenediaminetetraacetic Acid), Enzymes, Optical Brighteners, Chlorine Bleach, Petroleum derived additives, chemical plasticisers, Formaldehyde, Glycerine (vegetable sourced not animal derived), lanolin, Sodium Tallowate, synthetic dyes, synthetic perfumes and titanium dioxide. Products are approved by The Vegan Society, Naturewatch Trust, BUAV and The World Wildlife Foundation. I note that laundry products carry Allergy UK logo on the website. 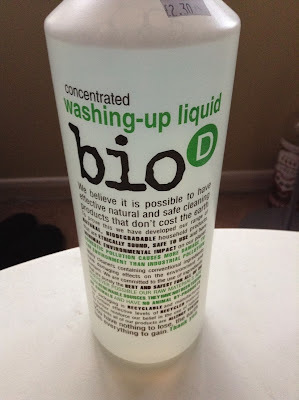 I stumbled across Bio D when I visited Vegfest and decided to buy the washing up liquid because at the time, I had been using and disliking one from Bentley Organics. The Bio D formula is concentrated so you do not need to use very much. The bottle is still going three months later and we wash up daily. It generates a nice amount of bubbles which do not disperse within five second of the dishes hitting the water. I'm not someone who cooks greasy food but this washing up liquid does clean up residue cooking oil on oven trays from chips or veggie burgers. I should point out this is an unscented product should anyone prefer scented cleaning products. Bio D washing up liquid does what I require it to do and that makes me happy (it's the simple pleasures). I certainly feel as if I have got value for money as I paid £2.30 for this giant 1 litre bottle. I will be looking into the entire Bio D range when I am next requiring laundry liquid or loo cleaner. Hi, I use Bio D washing up liquid. I love it and it is exciting! I believe they are among the most natural cleaning products you can buy. I love their washing powder - don't like the smell of the laundry liquid tho. I buy them in a little gift shop in Chew Magna, next to the post office - random!